Now, with Innosinpo Security IP Camera. You can watch each room in your house and keep your family safe. Two Way Audio: Excellent two way audio quality,you can speak to your baby and listen what your baby saying via Liveyes App. Night vision: High quality 960P HD live video no matter day and pitch dark. IR-Cut night vision gives you fantastic night experience. 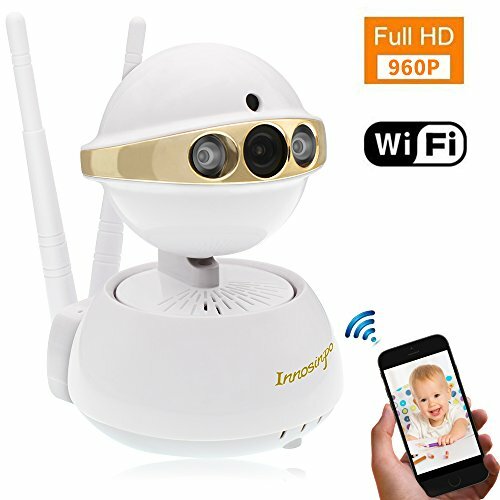 【FULL 960P HD VIDEO CAMERA】: Full HD Home Camera with 1280 * 960P resolution at 25fps, the Living Stream can be accessed via iOS / Android phone, Windows PC and Apple Mac software and http web browser, you can use it as a baby monitor To see your baby even when you are not at home. 【MONITOR NO DEAD ANGLE】: Remote Access, Live Paning and Tilt Live Video. Horizontal 355 degrees and 100 degrees vertically, wide viewing angle, see more and cover more. Get a complete overview of each room. Never miss the important minute. 【TWO WAY AUDIO & NIGHT VISION】: Respond to what you see and hear with built-in microphone and speaker, talk off the TV and listen. Nighttime monitoring is possible with the built-in infrared LEDs, which allow night-time viewing of up to 33 feet and allow 24/7 surveillance of a home or small office. 【MOTION DETECT ALERT】: This WiFi Day / Night Camera is a complete surveillance solution for your home or small office. The built-in night vision offers 24-hour monitoring with motion and noise detection. Instant notifications, real-time push notifications to your smartphone or tablet when motion or noise is detected. 【FAST & EASY TO INSTALL】: iPhone or Android Smartphone with APP Liveyes. Real "Plug & Play" offers the possibility to download the app by simply scanning the QR code in the manual. Streaming video and two-way audio directly on your smartphone, tablet, Apple Mac or Windows PC. If you have any questions about this product by Innosinpo, contact us by completing and submitting the form below. If you are looking for a specif part number, please include it with your message.